This is the second in a series of posts examining Tate’s excellent collection dataset. You can read the first part here.The R and R Markdown code for this series is available at https://gitorious.org/robmyers/tate-data-r/ . As before, let’s get started by loading the data. Next let’s load some code to visualize the number of artworks in the collection categorized as being produced by a particular movement each year. You can see the code in the Git repository above. It loads the Tate collection data files and declares some functions that we can use to plot movement artwork counts. These figures are available as PDFs in the Git repository. When did a movement start and end, and how long did it last? 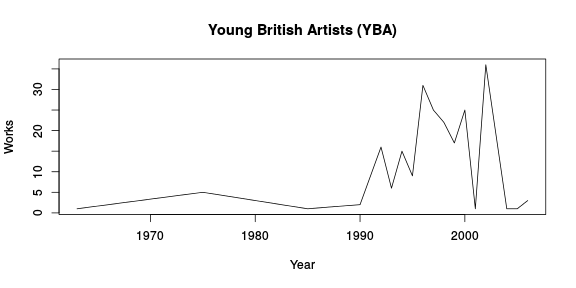 We can plot this for movements as defined by the date of production of the artworks labelled as being part of that movement in the Tate collection. These figures are also available as PDFs in the Git repository. We can use artists who are in two or more movements as links between movements, constructing a network graph of social connections between movements. Again, this figure is also available as PDFs in the Git repository. As you can see some of these graphics work better as posters or large-scale PDFs than as bitmaps. There’s much that could be done with curve fitting and comparison of movement artwork counts. 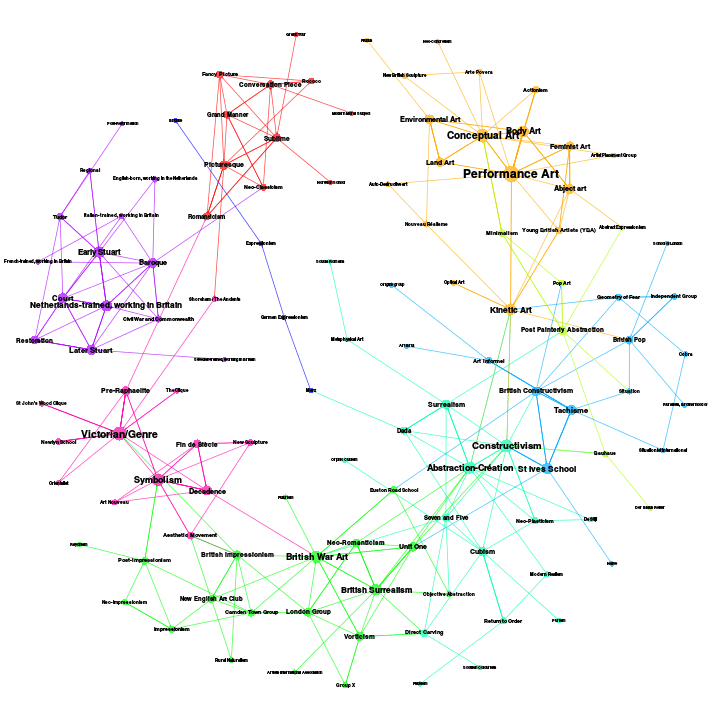 And all the techniques of social network analysis can be applied to the graph of artists and movements. Next we’ll look at artwork genres, which are not explicitly labelled in the collection dataset.